Saving over 3 weeks and bought 1 bundle ? And you caught 750 PHONES ??? This game is dying, fake accounts like yours are not the right way ! That pic is not to beat with my comments. Such a short try, to get a few coins from veteran players !!! BTW, you logged into a bad world. Many dies or only try to lie or are NG fake players !!! > Greetings everyone first time here on the forums! I've been playing for about 3 weeks now and am enjoying the game! 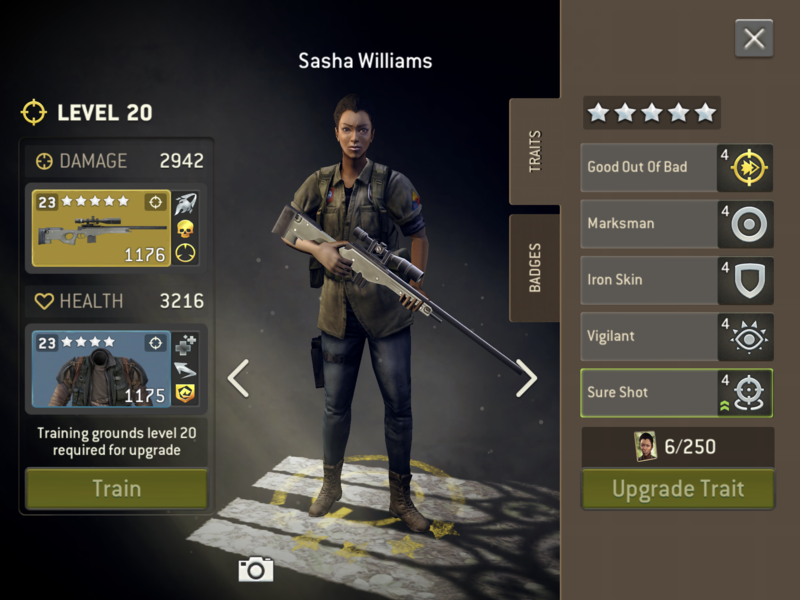 I read about heroes and found Sasha seems to be one of the best heroes from many sources so I went and burned about 750 radios to get her to legendary. > I definitely had a rollercoaster of luck. My first 20 calls were nothing but greens and teaser purple hero 32 tokens. I only pulled 2 64 Sashas and was beginning to doubt the drop rates. 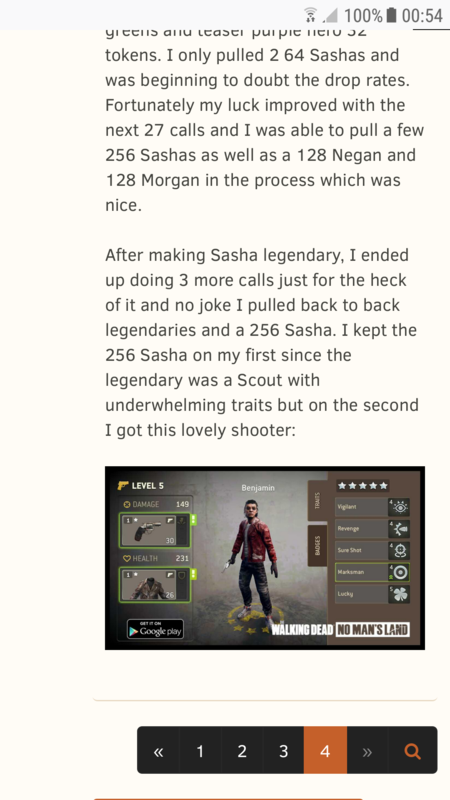 Fortunately my luck improved with the next 27 calls and I was able to pull a few 256 Sashas as well as a 128 Negan and 128 Morgan in the process which was nice. That shooter is good but not so good. Vigilant trait is awful. If i were you i wouldn't spend any tokens on him and i will wait for a better one. Hey guys thanks for all the suggestions. I'm slowly learning which traits are the best. I feel like I may not get a better shooter though because so much RNG is needed to get all the perfect traits. But I am still going to wait and see what is the best people to invest into. Even though I agree vigilant isn't the best trait, I feel like it can somewhat be viable on a shooter. But I'll just test him out and see how far he can take me. Ruthless is pretty much a must have for all classes except bruiser and assault, because they stun. Aside from that it’s mostly based off of your own personal play style, whether you’re more offensive or defensive. Yawn not gonna waste phones on Daryl but this week was great. Hopefully itll return "soon" please let it come back quicker then the last time. So is today the last day? Wow, I'm really disappointed. 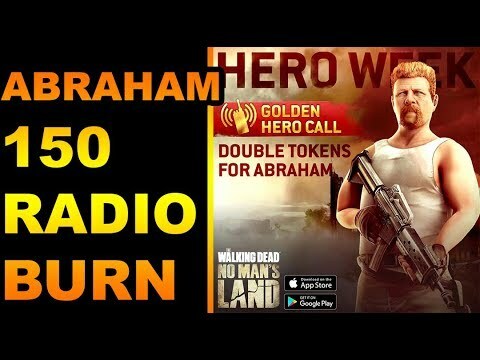 I wanted to spend phones on Abraham day. I have nearly 2,000 phones hoarded away. But I didn't spend ay of them on Abraham, because I was waiting for Merle. I was sure that Merle day would come. On the good side, I didn't spend any phones all week and I still have my phone hoard. But I would have rather had Merle tokens. I also would rather have had Abraham tokens. @Kaz Next time, can NG tell us in advance what the hero calls are going to be? If I'd known that Merle wasn't on the table, then I would have been able to spend phones. Instead, my big hoard just gets bigger, waiting for a future golden Merle day. If NG's intention in holding back the lineup was to get people to spend more phones, you failed. Had I known the lineup in advance, I would have spent well over 1,000 phones. But instead, I spent no phones. The obvious reason for not telling us the lineup ahead of time is to get us to spend our phones early then buy more when another hero we want shows up. Which is why I was sure that today was going to be either Aaron day or, like @TransmuteJun said, Merle day. It doesn’t matter to me because i spent every one of my 1000+ phones on Sasha yesterday. Just curious, how come you didn’t spend any on Sasha @TransmuteJun? I was expecting today to be Michonne. Even with her being featured a week or two ago, I think that only allowed many to unlock her but not progress her much, if at all. And there seemed to be many requests on the forum for her to be included. @Kaz I was happy to see Gabe as part of this Hero Week's line up. But we're still missing Eugene, Glenn, Rosita,Tara and especially Rufus (won't forget to include him for you, @Jenng!) from the Hero Week offerings. I realize the popular ones get a lot of the attention, but let's not forget that everyone should get their day in the limelight. Yes, clearly they wanted you to blow our phones and then spend when a better hero showed up. Which is why I didn't spend any phones and was waiting for the one I wanted! I did consider briefly spending some phones on Sasha, but I didn't for the same reason I didn't spend on Abraham. Oh! You’re speaking my love language @Dodkong , let it be so. Used Hero Week to get Carl to Legendary. Woop woop. You just had to fit in there somewhere didn’t you? Hit Posting-to-Andrea ratio was dropping it appears. No Merle this time = more phones for him next time around. Having hero week every now and again just helps to remind me how much worse every other call type is.